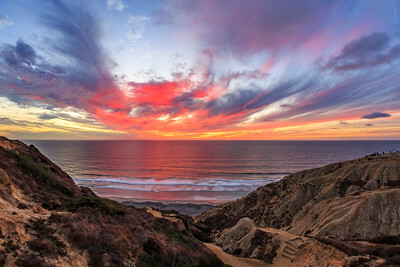 Tonight's colorful sunset at the Torrey Pines Gliderport. Later phase. 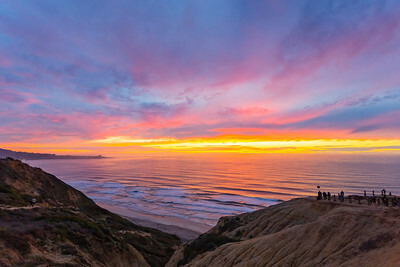 Tonight's colorful sunset at the Torrey Pines Gliderport. I only saw one glider tonight (timelapse video coming soon), but got to experience another epic sunset here. This is before a decent storm that will be hitting San Diego County sometime on Monday. 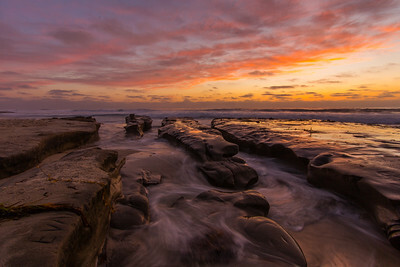 The Torrey Pines Gliderport is a city-owned private-use glider airport located in La Jolla, 11 nautical miles northwest of the central business district of City of San Diego, in San Diego County, California. The Torrey Pines Gliderport is the most historic aviation site in North America, with nearly 100 years of flying history. It is Southern California’s premiere location for paragliding, hang gliding, remote control models and sailplanes. The Torrey Pines Gliderport has played a pivotal role in the aviation industry of Southern California and the United States. Since the late 1920’s, sailplanes have been gracing the bluffs north of La Jolla. 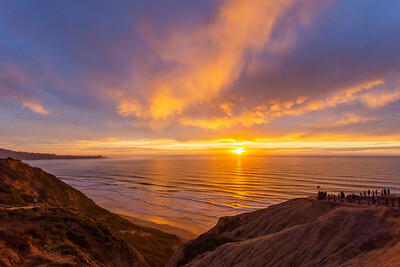 Many aviation pioneers had their first flights on the cliffs of Torrey Pines. On February 24, 1930, Charles Lindbergh had his maiden flight along the cliffs of Torrey Pines, soaring from Mt. Soledad to Del Mar and established the first gliding distance record. In 1936, Woody Brown launched and landed on top of the cliffs for the first “top landing” in Gliderport history. In the late 1930s, Hawley Bowlus, engineer and construction supervisor of the Spirit of St. Louis, began soaring the cliffs with his own sailplanes the Bowlus gliders. 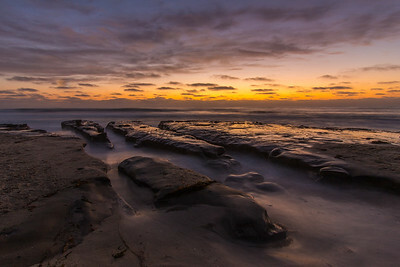 Tonight's colorful sunset at the Torrey Pines Gliderport. First phase. I only saw one glider tonight (timelapse video coming soon), but got to experience another epic sunset here. This is before a decent storm that will be hitting San Diego County sometime on Monday. The Torrey Pines Gliderport is a city-owned private-use glider airport located in La Jolla, 11 nautical miles northwest of the central business district of City of San Diego, in San Diego County, California. The Torrey Pines Gliderport is the most historic aviation site in North America, with nearly 100 years of flying history. It is Southern California’s premiere location for paragliding, hang gliding, remote control models and sailplanes. The Torrey Pines Gliderport has played a pivotal role in the aviation industry of Southern California and the United States. Since the late 1920’s, sailplanes have been gracing the bluffs north of La Jolla. Many aviation pioneers had their first flights on the cliffs of Torrey Pines. On February 24, 1930, Charles Lindbergh had his maiden flight along the cliffs of Torrey Pines, soaring from Mt. Soledad to Del Mar and established the first gliding distance record. In 1936, Woody Brown launched and landed on top of the cliffs for the first “top landing” in Gliderport history. In the late 1930s, Hawley Bowlus, engineer and construction supervisor of the Spirit of St. Louis, began soaring the cliffs with his own sailplanes the Bowlus gliders. Mother Nature provided a nice pre-Thanksgiving treat to those on the coast in San Diego County tonight. Have a nice Thanksgiving all. 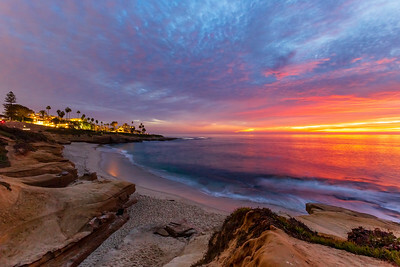 Shot at La Jolla Cove facing southwest. Canon 6D and Canon EF 17-40mm L f/4 lens at 3.2 sec f/6.5 ISO 800. Timelapse of this sunset coming soon. The Torrey Pines Gliderport is a city-owned private-use glider airport located in La Jolla, 11 nautical miles northwest of the central business district of City of San Diego, in San Diego County, California. The Torrey Pines Gliderport is the most historic aviation site in North America, with nearly 100 years of flying history. It is Southern California’s premiere location for paragliding, hang gliding, remote control models and sailplanes. The Torrey Pines Gliderport has played a pivotal role in the aviation industry of Southern California and the United States. Since the late 1920’s, sailplanes have been gracing the bluffs north of La Jolla. 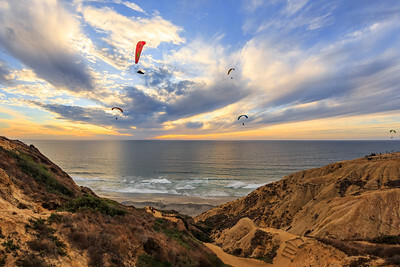 Many aviation pioneers had their first flights on the cliffs of Torrey Pines. On February 24, 1930, Charles Lindbergh had his maiden flight along the cliffs of Torrey Pines, soaring from Mt. Soledad to Del Mar and established the first gliding distance record. In 1936, Woody Brown launched and landed on top of the cliffs for the first “top landing” in Gliderport history. In the late 1930s, Hawley Bowlus, engineer and construction supervisor of the Spirit of St. Louis, began soaring the cliffs with his own sailplanes the Bowlus gliders. 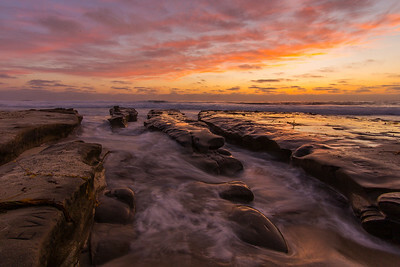 Did a sunset photo shoot with the Night Photography Lovers San Diego Meetup group. The Torrey Pines Gliderport is a city-owned private-use glider airport located in La Jolla, 11 nautical miles northwest of the central business district of City of San Diego, in San Diego County, California. The Torrey Pines Gliderport is the most historic aviation site in North America, with nearly 100 years of flying history. It is Southern California’s premiere location for paragliding, hang gliding, remote control models and sailplanes. The Torrey Pines Gliderport has played a pivotal role in the aviation industry of Southern California and the United States. Since the late 1920’s, sailplanes have been gracing the bluffs north of La Jolla. Many aviation pioneers had their first flights on the cliffs of Torrey Pines. On February 24, 1930, Charles Lindbergh had his maiden flight along the cliffs of Torrey Pines, soaring from Mt. Soledad to Del Mar and established the first gliding distance record. In 1936, Woody Brown launched and landed on top of the cliffs for the first “top landing” in Gliderport history. In the late 1930s, Hawley Bowlus, engineer and construction supervisor of the Spirit of St. Louis, began soaring the cliffs with his own sailplanes the Bowlus gliders.